Domestic production remained flat at about 1.42 billion gallons, compared with about 1.47 billion gallons in 2014 and 1.50 billion gallons in 2013. Meanwhile, imports rose from 510 million gallons in 2014 to an estimated 670 million gallons in 2015. CEO of the National Biodiesel Board Joe Jobe presented PACCAR with the Eye on Biodiesel Initiative Award. The new PACCAR MX-11 engine and all model years of its MX-13 engine, both legacy models and new equipment, are now approved for B20 use. 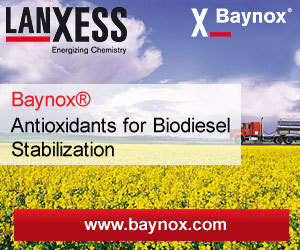 ExxonMobil Research and Engineering Co. and Renewable Energy Group Inc.'s Life Sciences subsidiary have announced an agreement to study the production of biodiesel by fermenting renewable cellulosic sugars from sources such as agricultural waste. Global soybean oil production has risen 5 percent, based on the 2015-'16 record supply of feedstock. In December, the FAO vegetable oil price index rose by almost 2 percent, but remains at a nine-year low although biodiesel production has increased. Australian Renewable Fuels announced its board of directors has placed the company into a state of voluntary administration, which is a form of insolvency arrangement. The firm cites declining oil prices and federal policy uncertainty as reasons. Intentional strategies of deception, modeled after those pioneered by the tobacco industry, are working to spread doubt about climate change and the need for action. At the 2016 National Biodiesel Conference, biodiesel is standing up for the truth. Oslo Airport Gardermoen is the world's first airport to offer renewable aviation fuel refined by Neste for refueling airplanes. Lufthansa, SAS and KLM have already announced that they will be refueling their planes with a renewable blend in Oslo. GoodFuels Marine, part of the GoodNRG Group, has received the highest standard of certification from the Roundtable of Sustainable Biomaterials, enabling the company to actively sell and promote RSB-certified biofuels to the shipping industry. After an extended period of policy uncertainty, the final renewable fuel standard (RFS) rule and a two-year retroactive reinstatement of the $1-per-gallon blenders tax credit are expected to bring stability back to the U.S. biodiesel sector. Despite less than ideal economic and policy conditions, the biodiesel industry continues to move forward, and not just one project at a time. Here are several plants that have come on-line in late 2015 or are preparing to start operations in 2016. According to the 2015 State Agency Greenhouse Gas Report Card, California GHG policies reduced more than 37 million metric tons of GHG emissions in 2013, and the state intends to quadruple that rate of reduction by 2020. An unabridged version of Ron Kotrba's earlier article about supermajor oil company Total S.A. converting its 150,000-barrel-per-day La Mède oil refinery to produce renewable diesel, a nervous-making project for the French biodiesel sector. Lutropur MSA can be used to improve process separations, eliminate formation of solids, allow processing of high FFA feedstocks and boost biodiesel yield. Lutropur MSA has several benefits over conventional acids used in biodiesel processing. Arkema introduces its Methane Sulfonic Acid – Low Corrosion (MSA LC), a low-corrosion version of its MSA that provides a wide range of benefits to the esterification industry in general and the biodiesel industry in particular. Eni, the Italian oil major that converted its Venice oil refinery to a renewable diesel manufacturing plant, is rolling out its renewable blended product to 3,500 fuel stations across Italy this month. The fuel contains 15 percent renewable diesel. Producers in Montana, North Dakota and South Dakota can now insure carinata by written agreement under the canola and rapeseed insurance plans, according to USDA. A written agreement request must be submitted to insurance companies by March 15. The U.S. Navy launches the first vessels of its Great Green Fleet Jan. 20 at the San Diego Naval Air Station North Island, Carrier Pier. The carrier strike group deployment, including an aircraft carrier and a destroyer, is powered by alt energy. The National Biodiesel Board recently filed a legal brief with the U.S. Court of Appeals for the District of Columbia Circuit regarding its petition for review of EPA rules on Argentinian biodiesel imports under the renewable fuel standard (RFS). IRFA announced Jan. 13 that despite policy uncertainty for nearly all of 2015, Iowa biodiesel production set a new annual record of 242 million gallons. The use of soy oil decreased, but it remains the largest biodiesel feedstock at 66 percent.